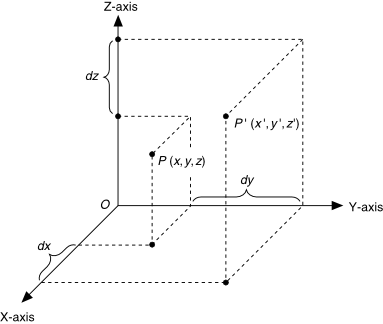 Shifts three-dimensional Cartesian coordinates along the x-, y-, and z-axes. This node shifts points within a fixed coordinate system. Shift amount along each of the axes. The sign of dx, dy, or dz is set to positive if you shift the coordinate in the default direction of Cartesian coordinate shift and negative if you shift the coordinate in the opposite of the default shift direction. Shift amount along the x-axis. Shift amount along the y-axis. Shift amount along the z-axis. The following illustration demonstrates how this node shifts three-dimensional Cartesian coordinates in the default direction of Cartesian coordinate shift, which means the signs of dx, dy, and dz are all set to positive.